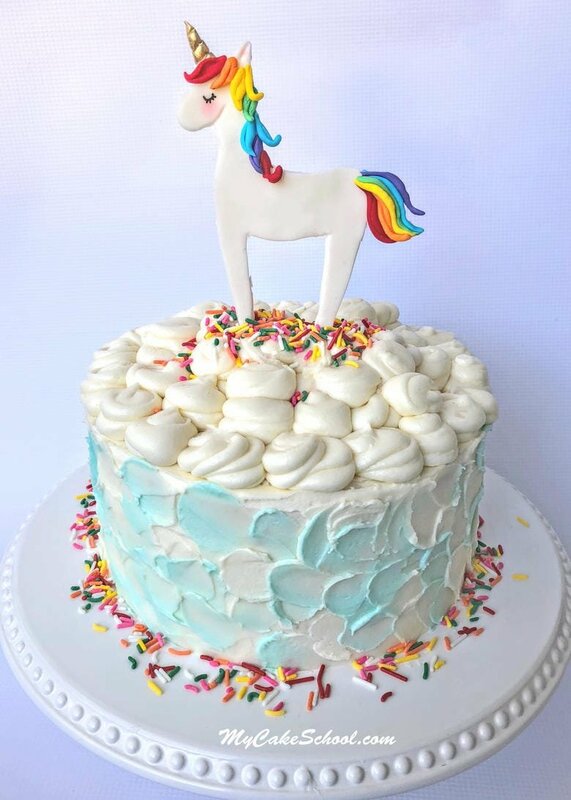 Unicorns continue to be hugely popular in cake decorating with no end in sight (hooray!) and today I’m going to show you how to make a super cute and easy Unicorn Cake Topper! We hope that you enjoy the tutorial! Don’t miss our unicorn cake topper template beneath the video, as well as a listing of the supplies used. Have fun! Todays cake is three 8 inch funfetti cake layers, Frosted in our Classic Vanilla Buttercream Frosting. Gold Luster Dust (optional- you can also use yellow). We used Rolkem super gold + vodka to create a paint for the horn. Then we dry dusted it with more gold dust for added sparkle). Allow at least 24 hours for your gum paste cut-outs to dry firm. You should always make two cut-outs when making cake toppers like this one just in case of them breaks. 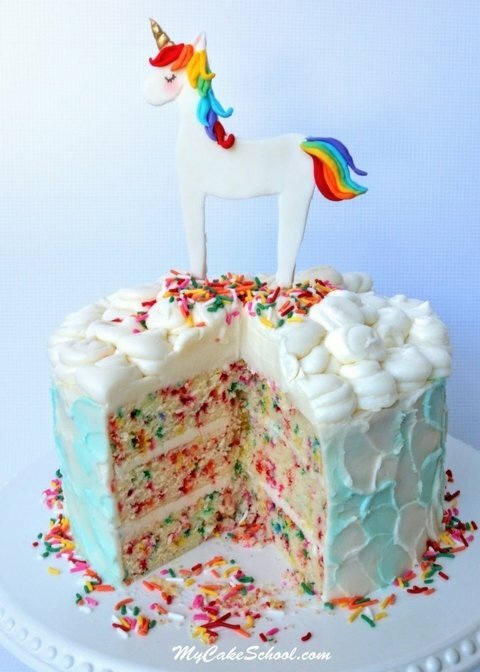 If you are a member of our site, make sure to check out our other Unicorn Cake video tutorial. This popular design is always a crowd pleaser! Thank you so much for this tutorial! I had never worked with gum paste or fondant before, but I made this cake for my daughter’s 4th birthday and I was so proud of it! Hi Carolyn, We are thrilled that the tutorial helped you!! Your cake looks fabulous, great work! I’m sure your daughter loved it! This has been on my wish list to make since you put it on the website! The problem is squeezing, because of my arthritis. Squeezing can cause a flare up. I have all the materials, I think. The white fondant is unopened, the colors have been unopened small packages that have sat, sadly, in the fridge a few years. Is there any way I can do the white horse one day and the colors another day, and attach the colors to the horse a third day? If I spread it out, I could do this adorable topper. That way, there wouldn’t be a lot of squeezing and rolling out in one day . I just adore it. There’s a little girl that would love it, too! Thank so much! Love you both. Love your creativity!!! I’m happy that you’d like to make this! You can definitely space it out as much as you’d like over several days. I do like to make my stand-up toppers like this with either gum paste or fondant with tylose powder kneaded into it so that it dries nice and firm. You can microwave the gum paste/fondant in small increments to soften it so that it will be easier for you to work with. I’m not sure how the pieces will stick together, if they are dry. Hi Judy, when you layer on the mane and tail pieces, you can attach them with piping gel. If you don’t have piping gel, but do have tylose powder, you could just mix a little warm water with tylose powder to create a “glue”, or you may even be able to get by with just lightly dampening the fondant pieces that you plan to layer on (this will give them a bit of tackiness). Hope this helps! AWESOME!!! I am copying all your comments for instructions when i do it. Will post pix! Hmm, if this works out, that carosel horse topper would be fabulous for the Ventura County Fair!